This image, taken by OmegaCAM on the VLT Survey Telescope at Paranal Observatory, shows a section of the Ara OB1 stellar association. This newly released image from the VLT Survey Telescope shows the young open cluster NGC 6193 in the center, and the emission nebula NGC 6188 to the right. This dramatic landscape in the southern constellation of Ara (The Altar) is a treasure trove of celestial objects. Star clusters, emission nebulae and active star-forming regions are just some of the riches observed in this region lying some 4,000 light-years from Earth. 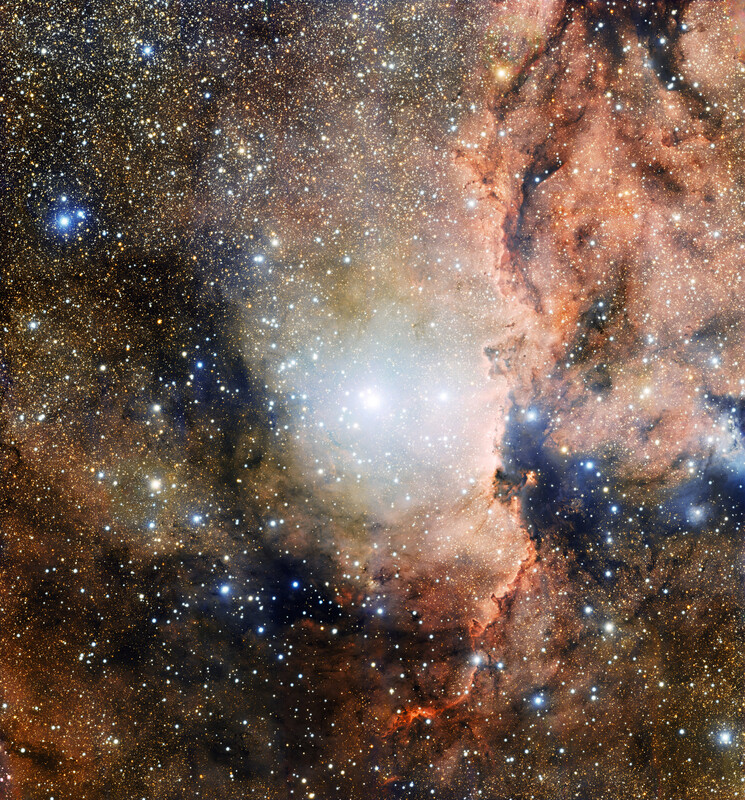 This beautiful new image is the most detailed view of this part of the sky so far, and was taken using the VLT Survey Telescope at ESO’s Paranal Observatory in Chile. At the center of the image is the open star cluster NGC 6193, containing around thirty bright stars and forming the heart of the Ara OB1 association. The two brightest stars are very hot giant stars. Together, they provide the main source of illumination for the nearby emission nebula, the Rim Nebula, or NGC 6188, which is visible to the right of the cluster. A stellar association is a large grouping of loosely bound stars that have not yet completely drifted away from their initial formation site. OB associations consist largely of very young blue–white stars, which are about 100,000 times brighter than the Sun and between 10 and 50 times more massive. This single spectacular image was actually created from more than 500 individual pictures taken through four different color filters with the VLT Survey Telescope. The total exposure time was more than 56 hours. It is the most detailed view of this region yet achieved. 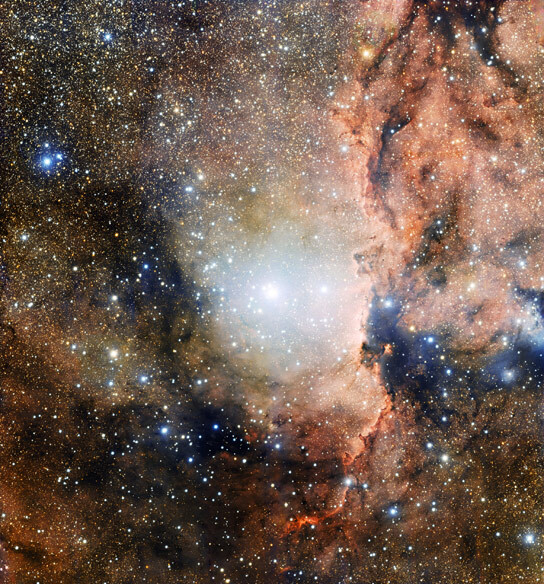 Be the first to comment on "New VLT Image Shows Star Cluster NGC 6193 and Nebula NGC 6188"